Background: A National Asthma Programme was undertaken in Finland from 1994 to 2004 to improve asthma care and prevent an increase in costs. The main goal was to lessen the burden of asthma to individuals and society. Methods: The action programme focused on implementation of new knowledge, especially for primary care. The main premise underpinning the campaign was that asthma is an inflammatory disease and requires anti-inflammatory treatment from the outset. The key for implementation was an effective network of asthma-responsible professionals and development of a post hoc evaluation strategy. In 1997 Finnish pharmacies were included in the Pharmacy Programme and in 2002 a Childhood Asthma mini-Programme was launched. Results: The incidence of asthma is still increasing, but the burden of asthma has decreased considerably. The number of hospital days has fallen by 54% from 110 000 in 1993 to 51 000 in 2003, 69% in relation to the number of asthmatics (n = 135 363 and 207 757, respectively), with the trend still downwards. In 1993, 7212 patients of working age (9% of 80 133 asthmatics) received a disability pension from the Social Insurance Institution compared with 1741 in 2003 (1.5% of 116 067 asthmatics). The absolute decrease was 76%, and 83% in relation to the number of asthmatics. The increase in the cost of asthma (compensation for disability, drugs, hospital care, and outpatient doctor visits) ended: in 1993 the costs were €218 million which had fallen to €213.5 million in 2003. Costs per patient per year have decreased 36% (from €1611 to €1031). Conclusion: It is possible to reduce the morbidity of asthma and its impact on individuals as well as on society. Improvements would have taken place without the programme, but not of this magnitude. In the early 1990s the Ministry of Social Affairs and Health in Finland (population 5.2 million) recognised asthma as an important public health issue and set up a national programme lasting from 1994 to 2004 to improve asthma care and limit the projected increases in costs.16 The Finnish programme is comprehensive and reaches deep into the structures of health care. The first results of the programme were reported at the end of 2000.17 The present paper summarises the results of the whole programme period from 1994 to 2004. The programme was run by the Finnish Lung Health Association (Filha), a non-governmental organisation (expert NGO, www.filha.fi) and employed one pulmonologist. Overall, the direct extra cost of the programme was €0.65 million including €125 000 from the Ministry of Social Affairs and Health who gave their political commitment to the programme. The intervention was managed by integrating the tasks into the everyday practice of healthcare staff. Most of the activities were part of the clinicians’ and administrators’ routine work. The programme obtained broad commitment from Finnish health care. For instance, a 1998 survey of chief physicians showed that 90% had changed their asthma practices in their clinics based on the programme.17 International adherence of doctors to the guidelines has been considerably lower.14 Of the 21 Finnish hospital districts, 65% have also launched regional programmes. The key to implementation has been the network of local asthma coordinators (one physician and at least one nurse) in each Finnish healthcare centre (n = 271). Two hundred local asthma-responsible physicians and 580 asthma-responsible nurses currently ensure the quality and continuity of asthma management in primary health care. Specialists in hospital based pulmonary and paediatric units have been responsible for regional cooperation, including developing and updating the referral and treatment network and regional guidelines. The programme has been enlarged twice. In 1997 nearly all Finnish pharmacies were included in the Pharmacy Programme. The Association of Finnish Pharmacies created a network of 695 asthma pharmacists in local pharmacies and started their continuous training. In 2002 a Childhood Asthma mini-Programme was launched. This consisted of practical checklists including (1) a good referral letter to a specialist, (2) a reply letter from the specialist to the general practitioners (GPs) and to the parents, (3) a structure for follow up visits, and (4) a self-management form to be individualised for each patient. Asthmatic children had been almost exclusively under the care of paediatricians, but the role of GPs and primary care had to be strengthened. There were four main educational steps. All State Provincial Offices were informed of the objectives of the programme and Filha organized (together with hospital pulmonary and paediatric specialist units) half-day educational sessions. The regional specialist units in turn invited the local primary care coordinators to attend these sessions (table 1). A summary of the activities of the Finnish asthma programme from 1994 to 2004 is shown in the online supplement available at http://www.thoraxjnl.com/supplemental. Primary care chief physicians in northern Finland (n = 58, response rate 78%) were surveyed by questionnaire in 2000.19 They reported that knowledge and facilities to examine asthma patients were good in 84% of the healthcare centres; 70% of the centres had arranged asthma education staff meetings during the previous 2 years. A regional asthma physician acted mainly as a consultant to other GPs and coordinated the work with regional specialists. Asthma nurses gave most of the patient education and served as contacts for patients. During 2000 and 2001 the asthma coordinating physicians (n = 248) were interviewed regarding their facilities and knowledge in 91% of the health centres.20 The organisation and resources for asthma care were well established (table 2). Asthma nurses were surveyed with regard to their practices in 2004 (n = 431, response rate 73%). In 92% of the health centres patients were recommended to visit an asthma nurse after a scheduled physician visit, and this was an organised activity in 56% of the health centres (A Pietinalho, personal communication, 2005). In 2004 regional adult asthma guidelines were available in 79% of the 21 hospital districts (in 52% also on their websites); 48% also had regional guidelines for children on their websites. For example, in Hyvinkää, a southern Finland hospital district (population 160 000), the regional guidelines were launched in 1998. The results of the implementation were evaluated before the launch (in 1997, 366 patients) and after (in 1999, 280 patients).21 A major change occurred towards better use of specialist services. Asthmatics stayed in specialist care for shorter periods (2.3 years before, 1.3 years after) and specialists took care of those with more severe asthma. Guided self-management was used more often (36% v 46%) and patient satisfaction had risen from 65% to 75%. Regular check-up visits also increased. In Southern Ostrobothnia (population 190 000) 26% of patients in 2000 and 48% in 2004 had made a check-up visit to their primary care physician during the previous year (L E Tuomisto, personal communication). The pharmacy programme has reached 94% of the Finnish pharmacies. In 2004 pharmacists provided patients with written or oral information on “preventers” and “relievers” during 98% of their purchases of asthma drugs.22 Instructions on inhalation technique was provided to 98% of new asthmatics, and to 34% of others. The inhalation technique was actually checked for 53% of new asthmatics and for 12% of the others. The number of hospitalisation days began to decrease before implementation of the programme, but is still falling. In 1993, a year before the programme was launched, the number of hospitalisation days due to asthma was around 110 000 (271/100 000 patients). In 2003 this number had fallen to around 51 000 (120/100 000 patients). The reduction in absolute figures was 54%, and 69% in relation to the number of asthmatics. Increase in number of asthmatic patients entitled to special reimbursement for their drug costs, increase in drug costs per patient, decrease in death rate, and decrease in hospital days due to asthma. Numbers are relative changes after 1981 (index, 1981 = 100). The absolute number of deaths fell from 123 in 1993 to 85 in 2003 (fig 1). As a proportion of patients with registered asthma, the respective rates were 0.91/1000 in 1993 and 0.41/1000 in 2003. From 1976 to 2003 a total of 27 deaths occurred among those under 20 years of age, with only 10 between 1990 and 2003 (annual death rate 0–0.35/100 000). In Pirkanmaa hospital district (population 450 000), emergency visits due to asthma decreased in adults by 24% from 1995 to 2003 and by 61% in children (official registry of Tampere University Hospital). In comparison with musculoskeletal or cardiovascular diseases or mental disorders, asthma is an uncommon cause for work disability. In 1993, 7212 patients of working age (9% of all asthmatics) received disability pensions from the SII compared with 1741 in 2003 (1.5%). The absolute decrease was 76% and, in relation to the number of asthmatics, 83% (fig 2). Increase in patients entitled to special reimbursement for their drug costs, decrease in patients on disability pensions, and decrease in patients attending rehabilitation courses for asthma. Numbers are relative changes after 1994 (index, 1994 = 100). Data from Social Insurance Institution. Daily allowances paid by sickness insurance for asthma decreased by 27% from 1993 to 2003. Compensation was paid for 145 200 lost days in 1994 (2966 sickness periods) and for 105 700 days in 2003 (1920 sickness periods). The respective costs were €5.2 million in 1993 and €3.9 million in 2003. These figures include only those involving at least 10 day absences from work, those days for which allowances are paid. 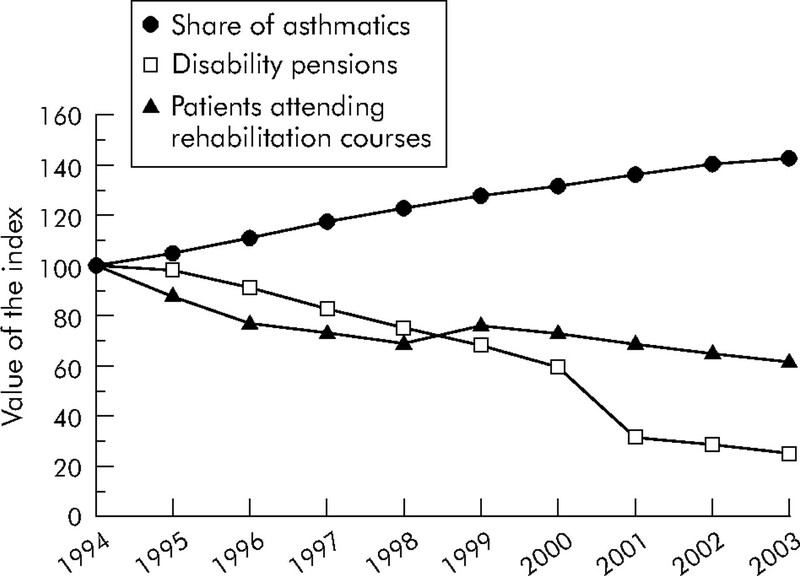 Between the years 1994 and 2004, the number of patients attending adaptation training and rehabilitation courses for asthmatics organised by the SII (the major financer of rehabilitation) fell 57%, from 2758 to 1181 (fig 2). Finland has strict legislation for occupational diseases, and all verified cases are registered. The number of cases of occupational asthma decreased in the 10 year period from about 400 to 300 per year (fig 3). This favourable trend is largely due to the long term active work of the National Institute of Occupational Health. In a Finnish population based follow up study, the proportion of cases attributable to occupation among 50 000 incident asthma cases was 29% (95% CI 25 to 33) for men and 17% (95% CI 15 to 19) for women, indicating that the effect of work is larger than generally assumed.29 No comparable data are available from other countries. 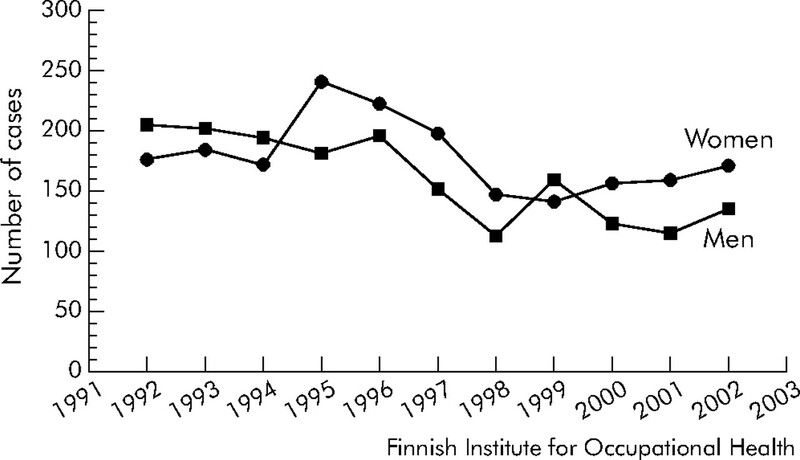 Registered cases of occupational asthma in Finland, 1992–2002. According to SII registers, in 1993 the number of patients with asthma entitled to 75% reimbursement was around 135 500, of whom about 19 000 (14%) were children. In 2004 the total number was around 212 000 (a 56% increase), of whom 28 500 (13%) were children—a 50% increase. 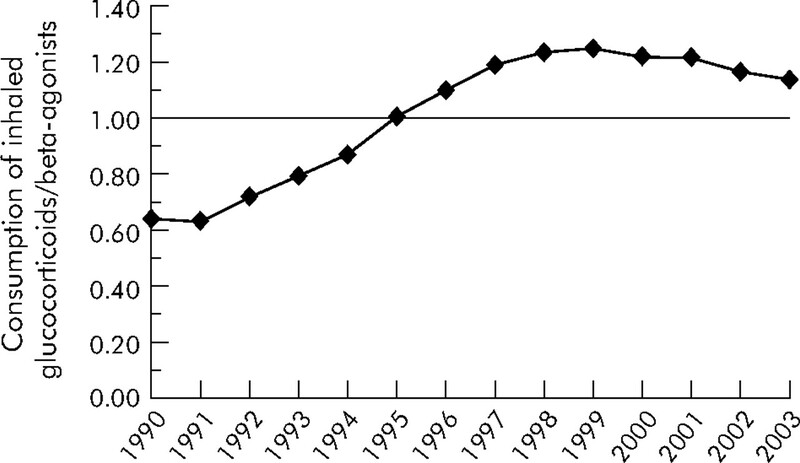 The number of registered new asthmatics increased steadily until 1997, since when it has been declining (fig 4A). (A) Number of new patients entitled to special reimbursement for their drug costs from 1994 to 2004, and all users of anti-asthmatic drugs from 1994 to 2004 (not only those receiving special reimbursement for persistent disease). (B) Incidence of asthma patients (%) according to the special reimbursement register in 2004 by age group. Data from Social Insurance Institution. The age related incidence of new registered asthma cases shows two peaks: a high peak among small children and another smaller peak among the elderly (fig 4B). Both peaks are slightly confounded, the former by overdiagnosis of asthma in infants and the latter by patients with COPD which, in the older age groups, accounts for about 5% of all patients entitled to reimbursement. 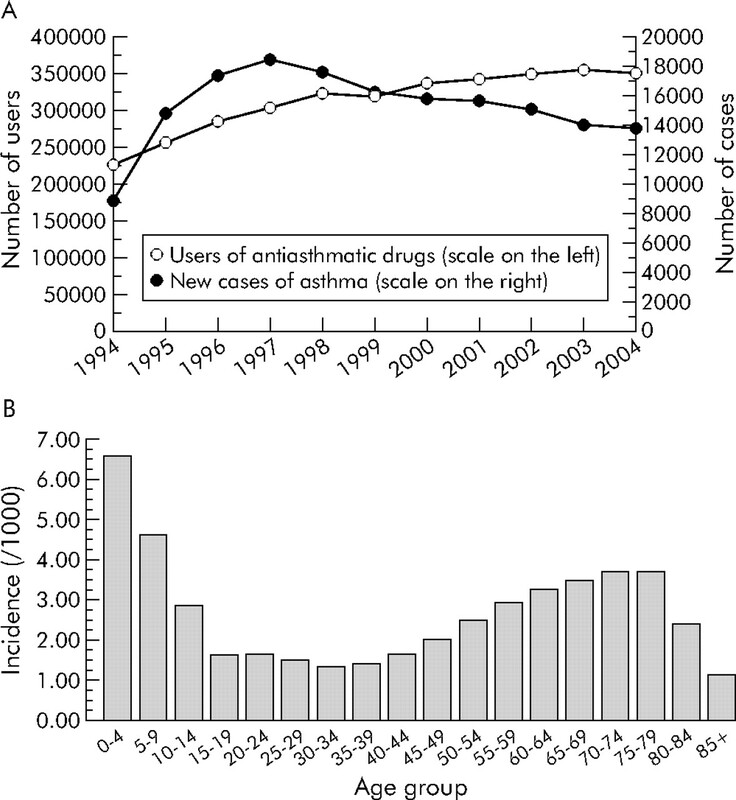 In another SII register established in 1994, prescriptions of asthma drugs increased steadily in the 1990s, but this trend slowed in the early 2000s and turned downwards during more recent years (fig 4A). In 1995, Finland was the first Nordic country to reach a ratio of 1.0 for defined daily doses (ddd) of inhaled corticosteroids to those of β2 agonists (fig 5). The use of combination inhalation preparations (salmeterol/fluticasone and formoterol/budesonide) has grown rapidly which has caused an increased use of β2 agonists, even among those with mild asthma. This ratio has therefore again been approaching 1.0. A shift was promoted from metered dose inhalers to dry powder inhalers because of the foreseen international ban against CFC (freon) propellants. In 1993 dry powder inhalers comprised 29% of the total number of inhalers sold compared with 84% in 2003. Ratio of consumption of inhaled corticosteroids and β2 agonists from 1990 to 2003 in defined daily doses (ddd/1000 inhabitants/day). A combination of steroid and β2 agonist was added to the prescriptions for both β2 agonists and corticosteroids. Data from National Agency for Medicines. Of the nearly 50 chronic diseases which entitle the patient to special reimbursement, asthma was the second highest at the end of 2004, with only hypertension ahead of it. In children, asthma was by far the most common disease. 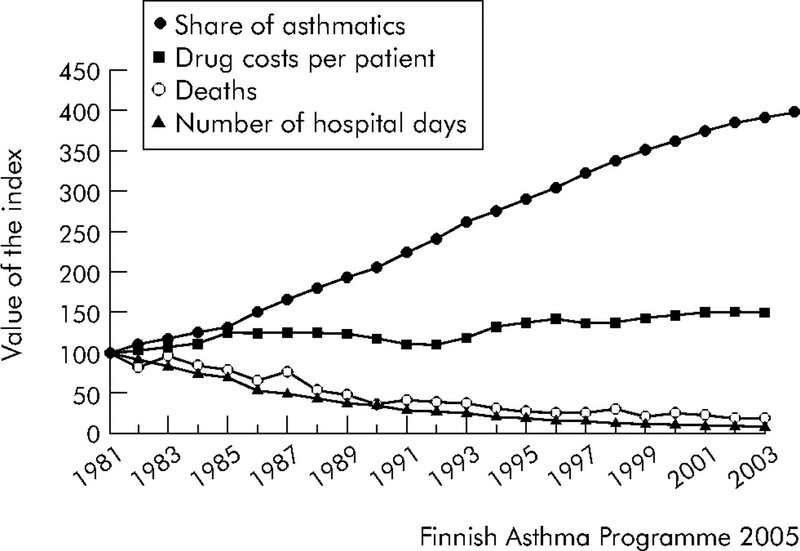 Costs attributable to asthma in Finland have decreased despite the substantial increase in the number of asthmatics (fig 1). In 1993, the year before the launch of the programme, the total direct costs from asthma and work disability were around €218 million (€1611 per patient), these sums being corrected by the inflation rate (fig 6). Ten years later the total costs of €213.5 million had decreased 2%, but costs per patient (€1031) had decreased as much as 36%. We can only speculate on the increase in total costs without the programme. If the costs per patient in 2003 had been the same as in 1993, total costs would have amounted to €341.5 million (potential saving €128 million for 2003). Development in health care and improved treatment would, however, have saved some costs even without the programme. Direct annual costs of asthma (medication, hospital days, doctor visits) and compensation for disability pensions and days off work in Finland, 1993 and 2003. The gross national product in Finland was €19 809/inhabitant in 1993 and €27 585/inhabitant in 2003 (index year in all calculations 2003). Data from Social Insurance Institution. In 1993, sales of anti-asthmatic medicines in outpatient care were €44 million (20% of total costs), but in 2003 this share almost doubled to €79 million (37%). The annual cost of medication per patient with special reimbursement—that is, persistent asthma requiring regular treatment—was 1.8 times higher in 2003 than in 1993. This growth is causing concern and is mainly due to the increasing use of steroid/β2 agonist combination preparations. The change to dry powder inhalers has also increased costs. Did we achieve the goals? The programme was aimed for the period 1994–2004. The changes in asthma management are summarised in table 3. We have been able to lessen the burden of asthma considerably and halt the increase in cost. The worrying trends are still the high incidence of asthma and growing drug costs. The preset goals were achieved as follows. The number of children and adults with new special reimbursement for drug costs reached a turning point in 2001 and is decreasing. The asthma epidemic in Finland is still ongoing35 but may have reached its peak, as has been suggested in some other Western countries.36,37 Moreover, many patients who previously received entitlement to special reimbursement for a restricted period may no longer need it after successful initial treatment. Several indicators show that the proportion of patients with severe complications has substantially decreased, as have physical limitations. The absolute numbers for hospitalisation days, disability pensions, allowances for days off work, and need for rehabilitation have all decreased 30–50% and, in relative terms, even more. The number of days hospitalised has fallen by 56% from 110 000 in 1993 to 51 000 in 2003, and in relation to the number of asthmatics by 70%. The trend is still downwards. When compensation for disability, drugs, hospital care, and outpatient doctor visits are taken into account, costs per patient have decreased 36% and, if related to the increase in gross national product, by 50%. To tackle common diseases like asthma requires a multidisciplinary action programme. This programme should include an operational plan for implementation and follow up. Effective strategies involve multiple methods, decision support systems, and interactive education.38 A broad commitment by the healthcare system and society is mandatory and should be sought at an early stage. The Finnish Ministry of Social Affairs actively supported the programme and acknowledged that asthma can be effectively detected and treated early.39–41 The steering group should be small (not more than 7–10 people), but it should comprise state officials, key experts, nurses, pharmacists, and patient organisations. Political commitment must be confirmed also at the regional level: state officials organised, in cooperation with the expert NGO (Filha), interactive sessions with the regional pulmonary and paediatric units. The regional specialist groups created a network of contact persons in local health centres as well as regional treatment guidelines and referral chains. The essence of long term success is to keep alive the network of contact persons, GPs, nurses, and pharmacists. As the programme shifted its focus from maintenance treatment to early detection and prevention of exacerbations, the pulmonologists and paediatricians had to rethink their practices in order to ensure functioning regional treatment chains. The patients usually first contact their health centres regarding symptoms. The shift in care from specialist to primary health providers has taken place over the whole country. Children are still mostly cared for by paediatricians; specialist work has also improved. For example, in a middle sized Finnish hospital in 1994, 16% of new asthma diagnoses were made during the first visit compared with 42% in 2001 (L E Tuomisto, personal communication). Small clinical improvements have a significant impact. For example, instructing primary care staff how to use a 2 week peak expiratory flow follow up and when to try a course of an inhaled steroid energised their work considerably. Furthermore, systematic teaching of the use of spirometry has proved useful. These simple means have essentially improved case identification and early intervention. Co-morbidities of asthma like rhinitis, as well as allergic factors causing disease persistence, have also been in the educational focus. Asthma treatment is drug centred and the programme recommended a simple medication regimen16 which has since been slightly modified. In recent years the decrease in new asthma patients entering the special reimbursement register probably indicates earlier and more effective intervention resulting in less persistent disease. When purchasing drugs, the asthma patient has an important contact with a pharmacist. Along with the pharmacy programme, asthma pharmacists began instructing patients in the use of preventers and relievers (noticing excess purchases of relievers) and on the inhalation technique. Peak expiratory flow measurements have also been a topic of instruction in some pharmacies. Pharmacists have been highly motivated to follow the new initiatives. Approximately 70% of all asthma is mild and may require only intermittent drug treatment.43 However, in both mild and more severe asthma, guided self-management is essential in preventing prolonged symptoms and exacerbations. Understanding and partnership are more important than compliance.44 The essential principles in asthma medication for adults and school-aged children are shown in Appendix 1. Childhood asthma requires special consideration and a mini-programme for children was included in 2002. An electronic, easy to fill in and print self-management form is serving as the written (and readable) action plan. The developed checklists for referral letter, diagnostic work, and follow up are helping in both primary and secondary care. This kind of programme cannot be effective without organised follow up and feedback, but even these are not enough. A rigorous evaluation plan is necessary in every large development programme. This was not fully acknowledged in 1994 when the Finnish initiative was taken, and caused problems in assessing the true impact of the programme. Financial resources are necessary to start up and monitor the programme, but the two key words for success are “motivate” and “organise”. Once the local work starts, it has its own dynamic which spreads to other regions who do not want to perform less well. The role of asthma nurses should be strengthened and made more independent. Educated nurses could tend to most routine check ups. Guided self-management should be further encouraged and a written action plan demanded. An electronic asthma follow up sheet has recently been developed for nationwide use. Clinical work requires handy tools to detect and monitor the inflammatory component of asthma. One recent innovation is a portable device to measure exhaled nitric oxide. Asthma in children under the age of 5 is often difficult to diagnose and, for treatment, specific guidelines may also be necessary to avoid both undertreatment and overtreatment. The combination preparations of inhaled steroids/β2 agonists may have improved the overall asthma control slightly but at a high cost. They are therefore not recommended as first line drugs.18 The unnecessary increase in drug costs should be halted. The Finnish government promotes a common electronic database for all healthcare providers to be in action in 2008. In the asthma treatment chain this database would allow, for example, better identification of patients in need of emergency visits and monitoring of prescriptions in local pharmacies. Get the disease under control with a moderate to high dose of inhaled steroid—for example, for 4 weeks. Adjust dose according to the need for a reliever, a rapid acting β2 agonist. Step down dose to maintain the result, and further down to identify the lowest dose to control symptoms and maintain lung function. Check inhalation technique and treatment adherence if treatment is insufficient. Intermittent symptoms. Inhaled steroid, for example in 4 week courses, rapid acting β2 agonist as needed. Mild, persistent symptoms. Inhaled steroid regularly, dose may vary. Rapid acting β2 agonist as needed. Leukotriene modifier as a possible alternative to inhaled steroid, which is usually more effective. Moderate, persistent symptoms. Inhaled steroid and long acting β2 agonist from two separate inhalers or from a single inhaler (combination preparation) regularly. Dosage can vary. Inflammation control can be improved by a leukotriene modifier or small dose theophylline, in which case a rapid acting β2 agonist used only as needed. Severe, persistent symptoms. Add corticosteroid tablets in the morning to this regimen. Increase inhaled steroid dose 2–4-fold for 2 weeks. Use β2 agonist regularly as well. With no improvement in 1–2 days, add corticosteroid tablets 20–40 mg in the morning for 10 days. Prevent further exacerbations by adjusting regular treatment; give long acting β2 agonist, leukotriene modifier, or small dose theophylline for longer periods of time. If disease control is not optimal, guide the patient to use peak flow measurements at home. If symptoms increase and morning peak flow decreases by more than 30% or by more than 15% on two consecutive mornings, treat like an exacerbation. The authors thank Aarne Lahdensuo for his contribution to the programme and Olli-Pekka Ryynänen for his aid, and are deeply grateful to the late Kaj Koskela who acted as a chairman of the programme. NHLBI/WHO. Global strategy for asthma management and prevention. NHLBI/WHO Workshop Report. US National Heart, Lung and Blood Institute and the World Health Organisation 1995. National Institutes of Health (NIH). National asthma education and prevention program. Expert Panel Report 2: Guidelines for the diagnosis and management of asthma. NIH Publication No. 97-4051. Bethesda, MD: National Institutes of Health, 1997. North of England Asthma Guideline Development Group. North of England evidence based guidelines development project: summary version of evidence based guideline for the primary care management in adults. BMJ1996;312:762–6. National Institutes of Health (NIH). Global initiative for asthma. Global strategy for asthma management and prevention. Bethesda, MD: National Institutes of Health, 2004, Available at www.ginasthma.org. Dahl R, Bjermer L. Nordic consensus report on asthma management. Respir Med2000;94:299–327. Boulet LP, Becker A, Berube D, et al. Canadian Asthma Consensus Report 1999. Canadian Asthma Consensus Group. Can Med Assoc J1999;161 (Suppl 11) :S1–61. Bousquet J, van Cauwenberge P, Khaltev N, et al. Allergic Rhinitis and its Impact on Asthma. ARIA Workshop Report. J Allergy Clin Immunol Suppl2001;108 (5) :S147–334. New Zealand Guidelines Group. The diagnosis and treatment of adult asthma. 2002. Available at http://www.nzgg.org.nz. National Asthma Council Australia. Asthma management handbook. Updated 2002. National Asthma Council Australia. Available at www.nationalasthma.org.au. British Thoracic Society, Scottish Intercollegiate Guidelines Network. British guideline on the management of asthma. Thorax2003;58 (Suppl I) :1–94. International Primary Care Airways Group (IPAG). Chronic airways disease. A guide for primary care physicians. IPAG diagnosis and management handbook. MCR Vision 2005. Rabe KF, Vermeire PA, Soriano JB, et al. Clinical management of asthma in 1999: the Asthma Insights and Reality in Europe (AIRE) study. Eur Respir J2000;16:802–7. Rabe KF, Adachi M, Lai CKW, et al. Worldwide severity and control of asthma in children and adults: the global Asthma Insight and Reality surveys. J Allergy Clin Immunol2004;114:40–7. Cerveri I, Locatelli F, Zoia MC, et al. International variations in asthma treatment compliance: the results of the European Community Respiratory Health Survey (ECRHS). Eur Respir J1999;14:288–94. World Health Organization. Adherence to long-term therapies: evidence for action. Geneva: World Health Organization, 2003:78. Haahtela T, Laitinen LA. 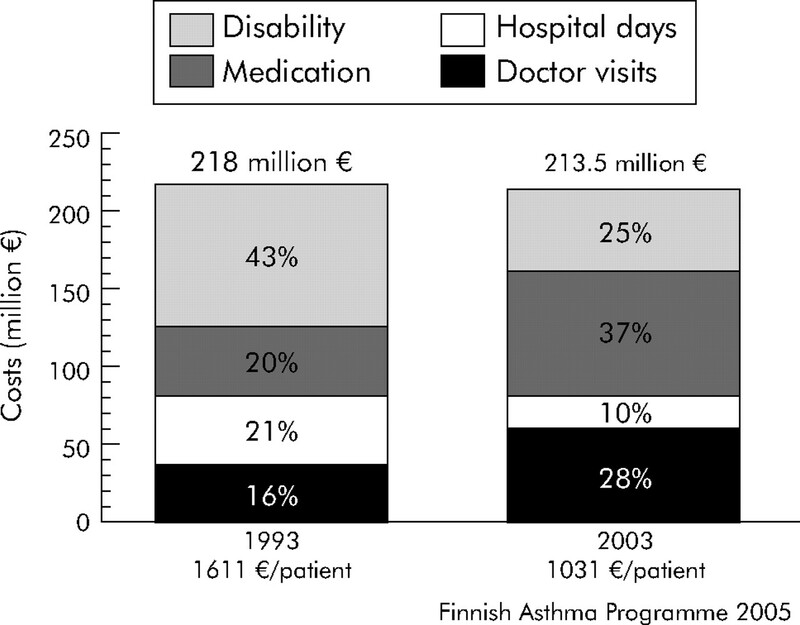 Asthma programme in Finland 1994–2004. Report of a Working Group. Clin Exp Allergy1996;26:1–24. Haahtela T, Klaukka T, Koskela K, et al. Asthma programme in Finland: a community problem needs community solutions. Thorax2001;56:806–14. Anon. Diagnosis and treatment of asthma, evidence based current care guideline (in Finnish). Duodecim2000;116:2568–94 updated 2006, in press. Ikäheimo P, Tuuponen T, Hartikainen S, et al. Patients’ low motivations makes problems in asthma management (in Finnish). Sosiaalivakuutus2001;4:24–8. Erhola M, Makinen R, Koskela K, et al. The Asthma Programme of Finland: an evaluation survey in primary health care. Int J Tuberc Lung Dis2003;7:592–8. Brander PE. Effect of regional asthma treatment chain on need for specialist care (in Finnish) Suom Lääkäril2003;58:1803–10. Peura S, Hirvonen A, Klaukka T. The first years of the Pharmacy Programme (in Finnish). Dosis2004;20:147–51. Klaukka T, Hirvonen A, Karhula K, et al. Good and bad news from asthma. Asthma barometer 2004 (in Finnish). Suom Lääkäril2004;42:4002–4. Kaila M, Pietinalho A, Vanto T, et al. The way childhood asthma is treated in Finland (in Finnish). Suom Lääkäril2004;33:2937–9. Ikäheimo P, Tuuponen T, Hartikainen S, et al. T. Achievements and shortcomings of Finnish asthma care. Scand J Public Health2004;32:310–6. Malmström K, Korhonen K, Kaila M, et al. Acute childhood asthma in Finland: a retrospective review of hospital admissions from 1976 to 1995. Pediatr Allergy Immunol2000;11:236–40. Valovirta E, Kocevar S, Kaila M, et al. Inpatient resource utilization in younger (2–5) and older (6–14) asthmatic children in Finland. Eur Respir J2002;20:1–6. Säynäjäkangas O, Lampela P, Pietinalho A, et al. National COPD programme half a way: changes in hospital use (in Finnish). Suom Lääkäril2003;58:4729–32. Karjalainen A, Kurppa K, Martikainen R, et al. Work is related to a substantial portion of adult-onset asthma incidence in the Finnish population. Am J Respir Crit Care Med2001;164:565–8. Peura S, Martikainen J, Klaukka T. Use and costs of asthma medication in 1980s (in Finnish, summary in English). Publication M: 72, Helsinki: Social Insurance Institution 1990. Helakorpi S, Patja K, Prättälä R, et al.Health and health behaviour of Finnish adults (in Finnish). Publication B13/2004. Finnish National Institute of Health 2004. Kouluterveystutkimus. School health study (in Finnish). Available at http://www.stakes.fi/kouluterveys/ktpaivat/index.html. Heloma A. Impact and implementation of the Finnish Tobacco Act in workplaces. People and Work Reports 57. Helsinki: Finnish Institute of Occupational Health, 2003. Piipari R, Jaakkola JJK, Jaakkola N, et al. Smoking and asthma in adults. Eur Respir J2004;24:734–9. Latvala J, von Hertzen L, Lindholm H, et al. Trends in prevalence of asthma and allergy in Finnish young men: nationwide study, 1966–2003. BMJ2005;330:1186–7. von Hertzen L, Haahtela T. Signs of reversing trends in prevalence of asthma. Allergy2005;60:283–92. Zöllner IK, Weiland SK, Piechotowski I, et al. No increase in the prevalence of asthma, allergies, and atopic sensitisation among children in Germany: 1992–2001. Thorax2005;60:545–8. Grimshaw JM, Russell IT. Achieving health gain through clinical guidelines. II. Ensuring guidelines change medical practice. Qual Health Care1995;3:45–52. Laitinen LA, Heino M, Laitinen A, et al. Damage of the airway epithelium and bronchial reactivity in patients with asthma. Am Rev Respir Dis1985;131:599–606. Haahtela T, Järvinen M, Kava T, et al. Comparison of a β2-agonist, terbutaline, with an inhaled corticosteroid, budesonide in newly detected asthma. N Engl J Med1991;325:388–92. Haahtela T, Järvinen M, Kava T, et al. Effects of reducing or discontinuing inhaled budesonide in patients with mild asthma. N Engl J Med1994;331:700–5. Lahdensuo A, Haahtela T, Herrala J, et al. Randomised comparison of self management and traditional treatment of asthma over one year. BMJ1996;312:748–52. Boushey HA, Sorkness CA, King TS, et al. Daily versus as-needed corticosteroids for mild persistent asthma. N Engl J Med2005;352:1519–28. Partridge MR, Fabbri LM, Chung KF. Delivering effective asthma care – how do we implement asthma guidelines? Eur Respir J2000;15:235–7. Finnish Association for General Practice. Guidelines for smoking, nicotine dependency and interventions for cessation (in Finnish). 2003. Available at http://www.kaypahoito.fi/pls/kh/kaypahoito?suositus=hoi50016. view PDF - Activities during 1994-2004 of the Finnish asthma programme. The Ministry of Social Affairs and Health and Finnish Lung Health Association (Filha) have supported this final report of the Asthma Programme.